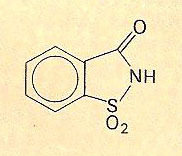 Saccharin, or o-sulfobenzoic imide, is a sweetening agent, 550 times sweeter than sucrose, normally used as its soluble sodium salt. Not absorbed by the body, it used by diabetics and in low-calorie dietetic foods. Early fears that it may be carcinogenic proved unfounded.